Get this Update via the Version Check & Automatic Update button. The Wrapper checklist feature is just a little reminder gimmick, but since it's frontmost on the settingsapp, it should be very helpful to people. Also click the 'Did you know...' Idea Blub in Central to get some tips. Click for random notes. May not be obvious to click it now, but i'll get that more obvious-er somehow. I have success port one game with CXex and i want to know that if i copy that game to other Mac and that Mac not yet install CXex engine, can that Mac open that game? I am trying to port the original game of Company of Heroes and I keep getting this weird error. This is my first time ever trying this on my own. What does this error mean and what can I do to fix it? Failed to find a supported hardware rendering device. Ensure that your system meets the minmum requirements for Company of Heroes\. Verify that DirectX is properly installed and that you have the latest drivers for your system. CXEx is basically the successor of CXZ, but with a lot of modifications that make it a better system than CXZ or CXS ever was. The Idea of CXZ was slimming down the huge Wine Wrappers that could go into the 160+ Megabyte range, without any Application or Game files. This system proved to be very effective and popular, but it also split the Userbase in two groups, one that preferred CXZ (external Engine) for it's small footprint and effective Engine sharing capabilities; and the other Group preferred the 'complete' Package that was still possible with CXS (internal Engine), where the Engine was integrated and you didn't have to install an Engine to make it work. Both systems had positive and negative aspects in this sense, but what if there was a system that would fuse both CXZ and CXS together and eliminate all of the negative aspects? CXEx is now the result of this fusion. All CXEx Wrappers carry their Engine inside the Wrapper (like CXS), but in a compressed format. Also all CXEx Wrappers can share a single Engine on a system (like CXZ). 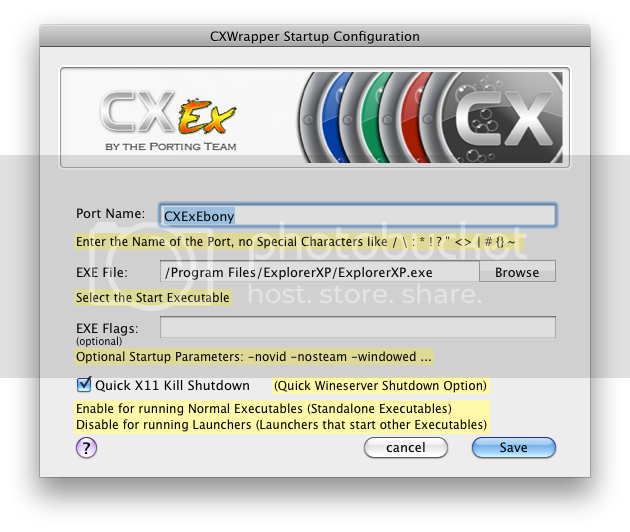 Every CXEx Wrapper has now also a built-in Startup Screen where a Port displays the Wrapper technology it is using and Information about the included Port. Think of it as a included Readme file for every Port. Look in the App Database with which Wine version you'll have the most success with, and use the corresponding CXEx Wrapper from CXEx Central. Alternatively, go from the newest to the oldest CXEx Wine Wrapper, you'll get different (better/not better) results that way. Every CXEx Engine has a different compatibility, older Games work better with older CXEx Wine Wrappers for example. Compatibility will always be the same (perhaps a little bit lower or a bit different) as CrossOver, so it's up to Codeweavers to make this better. If you want to use a Wine Wrapper that isn't dependent on third parties & modifications, check out Wineskin. What is CXEx and how does it work? For example somebody gives you a CXEx Ebony Port, and you do not have the Engine installed for this Wrapper. Upon first launch, the CXEx Ebony Port looks if there is already the CXEx Ebony Engine installed on your System. If it is from a previous CXEx Ebony Port, it uses that Engine and runs the Port. If the Engine isn't there on your system, the CXEx Ebony Port will automatically extract the included Engine into your system to run the Port. Couldn't be easier. No more downloading and installing various Engines, and also the Wrappers are relatively small compared to other Wrappers because of the Ultra 7-zip Compression of the Engines. Upon the first start of a CXEx Port a Startup screen will be displayed as well, where the Porter has (hopefully) included some Information about the Port. Why are there multiple CXEx Wrappers and Engines? Why multiple CXEx Wrappers and Engines? CXEx has it's roots in WINE. WINE is a code translation Software that was developed on Linux for 'emulating' ( see Wine Is Not an Emulator) Windows Code on their Platform. Each new Wine release adds compatibility for certain Games and Applications, but breaks some compatibility for others. Like some Games only work with WINE version 1.1.18, and don't work with the newer 1.2.1anymore. Traditionally Linux users have to make a choice for updating their installed WINE Engine for compatibility in some newer Games and Applications, or risk making already installed apps unusable or adding bugs to them due to some differences in the new Engine. We have a tremendous advantage with the different WINE Engines, because we can let each Game or Application talk to a different Engine without deinstalling another Engine. Since each of the CXEx Wrappers use other Engine files, this gives us tremendous potential on porting Games and Applications. I've decided a few months ago to get into Xcode a little bit, with no basic knowledge of anything cocoa or object-c. I've pondered a while on what i could do with it and decided i would rewrite all my previous Terminal and Bash apps & tools with Xcode and see what would turn out from that in the end. The app with the most benefit from that would be the old CXEx app. Well, you know how the old CXEx & CiderX & CXZ Porters are, plain, script-list, not so mac like. A few weeks later i've come up with a new design for the whole thing, and put in additional features and settings. Then some more. Then lots of other things as well. Basically i didn't want to release the thing since i said i'd shut it down, but i figured you guys would have the most use out of this app. Well, long story short, here would be my idea on how a 'native' management app should be for creating Wrappers. This app works similar to Wineskin Winery, with downloadable content, changeable settings and lots more. Basically everything is new and improved, and very thoroughly tested. Besides the actual CXx base code, which doesn't fall into my set of skills. doh's the person to talk to for improving it, and if you want to get crankin' on the CXx base code yourself, feel free to grab it here. CXEx Central may be a bit confusing at first, but every button/feature is documented. Press the (?) Button in the Wrapper settings to show descriptions; go the the [ Online Manual ] Tab in Central for a detailed explanation on how things in Central work. If it's still too confusing, stick with Wineskin Winery; Winery was designed more for new users to porting, while i took the more experienced approach. The whole thing is pretty easy to use, and lots of cool new things to choose from, so knock yourself out with the new CXEx. I'd figured i'd give you all the option to mess around with Central / the Wrappers / the custom Launcher first, before i spend another two weeks writing tutorials for it; since i've been mostly done with the app for some weeks now. The heart of CXEx, or more like CXSkin (by doh123) as it once was, is available as a source here. The whole CXEx Package (CXEx Central + CXEx Wrapper+Settings) is however, not open source, since it's my own implementation built on top of the CXSkin Source. CXSkin died years ago, and development of the core with it. If you want to pick up the breadcrumbs that got left behind, feel free to do what you like. Hi, as a few of you might know I've been working on a HiRez Native Launcher for the past week, specifically for the Tribes Ascend game. I've made a lot of progress, but there are a few things that still need to be done, the most important being the installation of the game without the need for windows or a VM. This launcher is used by HiRez Studios for their other games as well, and the result could end up being a fully featured Launcher for all of them (Smite, Tribes Ascend, Global Agenda). It's a pretty big project, so any help would be appreciated. A private and a public beta will follow, before the release. I will need 4-5 beta testers for the private beta test, they will only be needed to test the launcher, and not the game itself. You will need to download approximately 3GB from the net! Only members of the forum please, Porters have priority. First come, first served. Oh, and admins / mods I'd appreciate a Member's project thread! Thanks! Sorry to those who didn't make it in, you will be able to test the public beta soon. Once the first working version is ready, you will receive a PM with instructions and the link to the file. You will then need to post here your results. The first test is underway! Instructions and links have been sent to the private testers! I am going on, trying to find a way to decompress the archive! After that, it's just a matter of porting! Thanks for your interest! I'll try and make sure your time is rewarded by giving you the ability to finally play this great game! Hi, i had a problem on running left4dead2 on mac. I've try using CXEx Central update version to install CXEx Black Diamond, but than when i try to open left4dead2 it keep telling me Engine requirement CXZ Black Diamond Engine was not installed. I didn't want to trouble you, but if you would link me up some free site i could load without having the site benign band or couldn't get thought. New: Legacy Upgrades - CXEx to CXZ Engine Linker. This option allows you tolink over your existing CXEx Engines to the old CXZ path. This allows you to run CXZ ports with the new CXEx Engines. First Update to CXEx Central. Testing out the new Update system, but it should work flawlessly. X connection to :3595.0 broken (explicit kill or server shutdown). Icewind Dale II has been driving me crazy. The game suffered from a flickering cursor and major slowdowns most of the time, but not always. Searchign for the cause I found the most unlikely reason ever: an open finder window of the folder containing "Icewind Dale 2.app"
This must be the weirdest bug ever. I don't even mean the folder for the content of the wrapper (right click -> Show Package Contents), but litereally the folder (e. g. "Games" or whatever). It is the finder window, nothing else, I checked so many times, quit every application, it is always the finder window. The Icewind Dale theme is going to haunt me tonight. Changing the folder and opening the new folder caused the exact same issue. Putting the wrapper onto the desktop worked fine, as long as there was no finder window of the desktop open. Launching the game from a stack works perfectly as well. I even tried the same thing with Forklift, another file manager, but nope, everything works fine. It is ONLY the Finder. But it doesn't just affect icewind Dale II. King's Bounty gets that weird bug where characters are not drawn except for a few polygons floating. I don't know about IWD2, bu in King's Bounty there is usually an override for msvcrt.dll set in Winecfg. Maybe that helps. I would upload my ports, but my internet connection wouldn't be able to handle it. If there are some logs I could post to help out, then please someone tell me what to post. 11-05-19 12:03:20 AM	[0x0-0x92092].com.portingteam.CXExSettings	osascript: OpenScripting.framework - scripting addition "/Library/ScriptingAdditions/Adobe Unit Types.osax" declares no loadable handlers. Well, this is kinda weird. With everyone drooling over one-app-interfaces for Wrappers instead of app based functions, i tried my hand at an Interface. I liked the app-based structure of Wrappers, you could do specific things in less time than navigating a huge interface. But, this all-in-one thing may have some benefits as well as i've found out, and the multiple-app interface did have some very annoying aspects. So i've thrown out all CX apps in the Wrapper, and also i got rid of the single 'Port Information.app' and 'Engine Installer.app' in a CXEx Wrapper, latter one was a GUI dummy anyway. Because of these steps i had to rewrite the Wrapper and most of all previous app-based programs almost from scratch, to get rid of all apps and to make one GUI for everything. So this GUI doesn't work on normal CXEx Wrappers. With this in mind, i didn't plan to release this, but i wanted some input about the CXEx Settings GUI from you guys anyway, perhaps i'll push out one last Update to CXEx with the reconfigured Wrapper and the universal Settings app. Tab Screen 1 is pretty clear. Tab Screen 2 has everything you'd need for installation or file management, even the Grim Reaper has found a home. Tab Screen 3 has a mini-preview of the Startup Screen on the current Wrapper, and there are some buttons which let you open the banner & text file in your editors. Also some icon import options, import .icns file or convert a picture into a .icns file and import it. Under all that is a preview button for the call to the normal Startup Screen. Engine Changer, custom app maker, edit reg files, view log files. So nothing new here in terms of functions, just every app that was there previously in one GUI. What could i do better? Which screen should be the first tab? Are the buttons grouped well together? As said, this may not get released at all, i was just experimenting on a all-in-one GUI; and almost every fuction currently relies on a bash-call, since i'm just a XCode beginner. Aside from that, it's not just a dumb .nib file in Xcode, but a fully working Interface for a frankenbuild of a CXEx Wrapper. There are some other cases other than the vcrun command that use this lowercase variable. I'm not sure this helps generally because Winetricks is so buggy (sometimes a package works, sometimes it doesn't, and people get misled by the cache), but it's worth further testing. Perhaps this works for some other winetricks annoyances as well. CXEx Porter System Update v1.3.0 is on the Server. HUGE thanks to Drakulix for the code. Also the Wrapper itself and the subapp in /MacOS will get automatically renamed via changes in the Port Name field in the CXWrapper app. Welp, my topic was locked. Anyway, can I get a link for how to use a wineskin wrapper? I have the wrapper and a .exe copy of the game (CS 1.6) and I'm not sure how to run it. I know, I'm an idiot. #70273 Where can I download CXEx Carbon Engine? I've been searching for CXEx Carbon Engine for a while now. Does anybody know where I can get it? #64151 Is CXEx working with lion? Hey, I'm trying to create a port for Bloodline Champions, but CXEx doesn't seem to be working. Whenever I make a new wrapper, and try to use the software installer to install the game, the installer pops up in the dock, but immediately closes. After that, I can no longer open the software installer. Clicking on the software installer button does absolutely nothing. Is CXEx working with Lion? The CXZ Project is now discontinued. CXZ, CXS & CXSkin Wrappers do NOT work in Mac OS 10.7 Lion anymore, and have a outdated code. The CXEx System is the successor to CXZ, please see this section for porting with CXEx. BOTH OPTIONS CAN BE DONE WITH A JUST FEW CLICKS, SO THIS IS VERY EASY! #87964 Counter-Strike 1.6 for OS X Lion? I need someone to link me a working port, I've been looking for ages. Also, if there are other things that I need to do other than unzip and play, please tell me.